Fighting Irish Thomas: USC 38, ND 3: Weis' Irish Wake? USC 38, ND 3: Weis' Irish Wake? There was much laughter in Troy-ville yesterday, and all at Notre Dame's expense, as the Southern California Trojans trounced the smile-less Irish 38-3. Indeed, the merciless hosts, led by happy head coach Pete Carroll, whom the cameras caught emitting belly-laughs at his once-proud opponent's expense as early as the second quarter, took no prisoners and forced the Notre Dame fans into the exiled spirit of Advent (whether they intended to attend Mass or not) and left the faithful to wonder if the wounded leader of their Fighting Irish would soon join the suddenly expanding ranks of the Fired Irish too. As this conquest of the Irish was so complete, a brief but painful synopsis should more than suffice for Notre Dame's (still) loyal sons and daughters. It began with the Irish's opening drive, when jittery Irish QB Jimmy Clausen found himself in a pickle, and unloaded the 1st of his 2 INT'S. The Irish defense then provided a glimmer of hope when they got the ball right back, intercepting SC QB Mark Sanchez for only the 7th time all season, but once again the offense couldn't capitalize. Indeed, the Irish D played decent at times, forcing 3 Trojan interceptions, but one had the feeling they would have needed 33 turnovers to make a difference due to Notre Dame's offensive ineptness. In fact, the Irish offense was so offensive that it didn't make a first down until the last play of the third quarter. Or even worse; Clausen finished the game 10 for 20 for a grand total of ... 41 yards! Even Irish RB James Aldrich's respectable 12-58 yds. rushing totals are deceptive, for not only did they come at the end of the game against mostly the Trojan second team defense, but they also included a fumble that precluded a second Irish score which would have covered the astounding 32-point spread and at least sent the Las Vegas Irish home happy. But after a 6-6 season that by all standards failed to "wake up the echoes," the question becomes if this game was also 4th year head coach Charlie Weis' Irish wake. On the one hand, alumni voices like The Vortex's Michael Voris says this record against a soft schedule signals that its time for Weis to resign. On the other, alumnus such as the clever inventor, Kevin Grogan, grant that as sorry as Charlie's 9-15 ledger over the past 24 is, you cannot replace Weis unless you first have someone better. For me that means a coach that is not only competent, but Catholic. This is an elusive task, as the Irish higher-ups found out when they thought they had King Urban the Conqueror for hire, only to have Coach Meyer forsake service of Our Lady for Gator Glory. 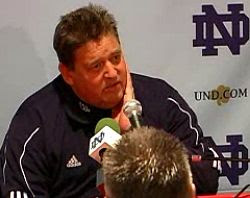 Weis' Catholicism, like his coaching, isn't perfect (Charlie must be commended for his strong family life as well as his insistence that the players sing "Notre Dame, Our Mother" to Our Lady after each home game, although his swearing and arrogance are negatives), but they are certainly an improvement on the Protestant Pep-Talks of predecessors Bob "Not Ready for Prime Time" Davie or Ty "Winless in Washington" Willingham. Currently, the only names that come to mind are not legends themselves but sons of Catholic Hall of Famers, namely current East Carolina coach Skip Holtz or former Alabama head man Mike Shula, and, although neither would be clearly better than the suddenly stumbling Weis, I would give Holtz a shot based both on his faith and his father's royal Irish lineage if Skip were interested. As for the Irish faithful, whether they echo Isaiah from today's first reading, "Oh, that you would rend the heavens and come down ... as when you wrought awesome deeds from of old,"
or merely pray that famous chorus, "Shake down the thunder from on high," this Advent is doubly a time to be humble but hopeful. Still, whether you wear a hair-shirt or a Suffering Irish t-shirt, may you be comforted in the fact that Fighting Irish Thomas both understands and feels your pain.